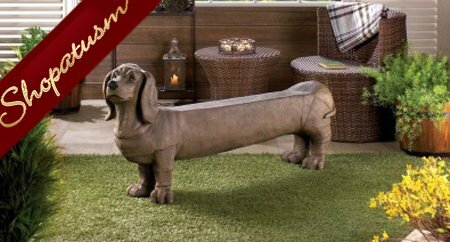 This Dachshund Doggy Bench is adorable from top to tail and will charm your friends and family as they gaze upon his happy face and elongated body. He's the best pet you'll ever own, with no upkeep or maintenance, and can be a great help in the entry way of your home, on your porch, and beyond! Max. weight limit: 300 lbs. Item weight: 51 lbs. Due to the size and weight of this item, we are ONLY able to ship it within the Continental United States. 53 inch x 10 inch x 25 inch high. Polyresin.